Ten days after I had given up on the return of Trust Us with Your Life, I learned of wonderful news (via The Hollywood Reporter, h/t Jonathan Mangum): Whose Line is it Anyway? is returning to television this summer! The Whose Line reboot will air on the CW, which was home to Drew Carey’s Green Screen Show prior to the WB’s merger with UPN. According to THR, Whose Line marks the CW’s return to comedy. They’ve otherwise been known for teen dramas. … Based on the U.K. format, which spawned the 1998-2004 ABC series led by Drew Carey, Whose Line will feature the return of Ryan Stiles, Wayne Brady and Colin Mochrie, who, along with a special guest each episode, will put their comedic skills to the test through a series of improv games. Prompted by ideas from the studio audience and [host Aisha] Tyler, the performers use the information and their imaginations to depict different characters, scenes and perform songs. A winner will be named at the end of each episode. Posted by Mike C. in Jazz, Music, Personal, Theatre. While rearranging CDs in my room, which I’ve done here and there since Sunday night, I found a couple of set lists I transcribed while at two concerts in 2005. The concerts were at the IMAC (Inter-Media Art Center) in Huntington; my first and second shows there, respectively. I was a semi-regular at IMAC until December 2008. Six months later, the theater closed. I thought it was temporary at the time, but it was quite permanent. In November 2009, the executive director, Michael Rothbard, suddenly passed away. 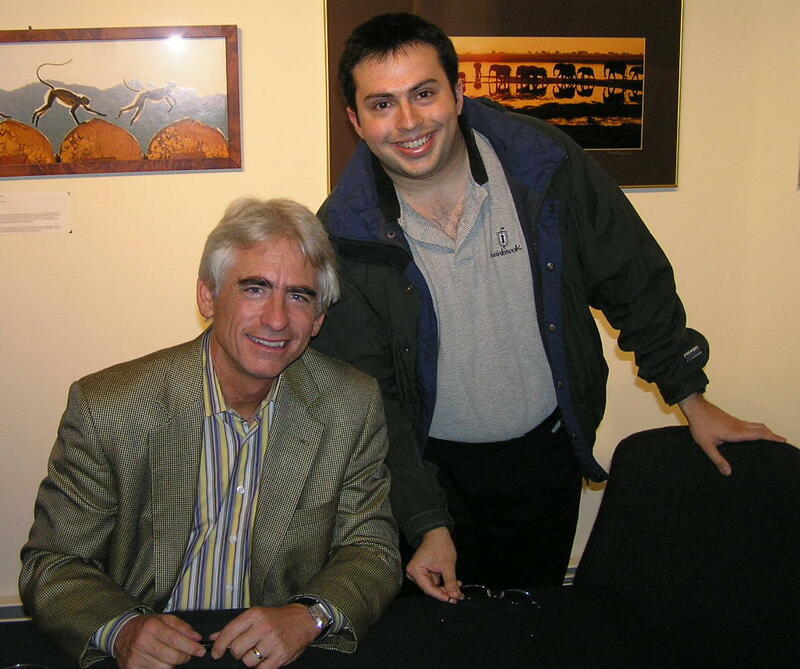 The second set list is from David Benoit’s 10:30 PM show on September 24, 2005. David Benoit played piano and keyboard with David Hughes on bass and Jamey Tate on the drums. For me, IMAC lives on through these posts. Posted by Mike C. in Airchecks, Comedy, Internet, Interviews, Jazz, Media, Music, Personal, Politics, Radio, Theatre. I was Googling my name just now and came across this page. It’s the website Dave’s Gone By, a weekly radio show hosted by Dave Lefkowitz. There I found an interview I did–in which I was the interviewee–for the Dave’s Gone By New Year’s Craptacular special on New Year’s Eve 2006. You can hear that interview here. It starts at the 8:11 mark. About four years later, I was the interviewee again during the Fan Phone Call segment of Alison Rosen’s UStream show, Alison Rosen is Your New Best Friend. You can hear that here. Posted by Mike C. in Comedy, Commentary, Game Shows, Media, Personal, Radio, Theatre, TV. Sound Effects – I’m a perfectionist. With the exception of Rich Fields and Steve Kamer, audiences members’ attempts at sound effects are tough to watch. Moving People/Bodies – This is also tough to watch. Mousetraps – All I can say is ouch! I feel for whatever two performers have to participate. Bob’s Call – When Bob Derkach hears a line that songs like a song, he’ll improvise a song and the two performers in the scene have to do the same. I’m hoping there will be more Improv-A-Ganza in the weeks, months, and perhaps years ahead. But unfortunately, it may not be around much longer, either, as it is suffering from low ratings. I got so caught up in watching each episode and savoring every moment, I didn’t consider looking up the ratings. Since the show’s competition includes cable news opinion shows, I’m not surprised. The ratings would probably be higher if DVRs were factored in. I’m one of those DVRers, if that is a word. I watch my Improv-A-Ganza recording later while watching Fox News Channel’s The O’Reilly Factor as it airs. I convert each episode to my MiniDV camcorder then capture those episodes to my computer as AVI video files. The final step is normalizing audio and inserting fades or crossfades then rendering as MPG files and deleting the AVIs to save hard drive space. Unfortunately, the recordings are in SD (standard definition) because Cablevision hasn’t added GSN’s HD feed. Improv-A-Ganza airs in HD. If Improv-A-Ganza is in its last days, then there is an upside: there will be more episodes of this show than the Green Screen Show. 5/25 UPDATE: Last night’s episode featured those so-so rated games Bob’s Call and Compilation Album. I liked them both. Moving Bodies was all right. 5/26 UPDATE: I have a theory about some of the Improv-A-Ganza ratings analysis. The show is not a traditional game show, yet it’s on GSN. Therefore, if its ratings can be negatively spun, perhaps that will hasten its cancellation. It’s similar to the Fox Business Network (FBN): highlight the channel’s low ratings and root for its demise. I’m probably wrong. It is, after all, just a theory from a fan of Drew Carey’s improv franchise, from the American Whose Line to Improv-A-Ganza. Stand-up comic, producer, writer and host of “The Price is Right,” Drew Carey, will return to the Hollywood Theatre at MGM Grand with his Drew Carey’s Improv-A-Ganza. Audience members may appear in an original, primetime GSN (Game Show Network) television series being shot during these special live performances! 6/3 UPDATE: Or is it? Tonight’s show was the season finale. Let’s hope it wasn’t the series finale.